A complete pet food for adult dogs aged 1 7years. 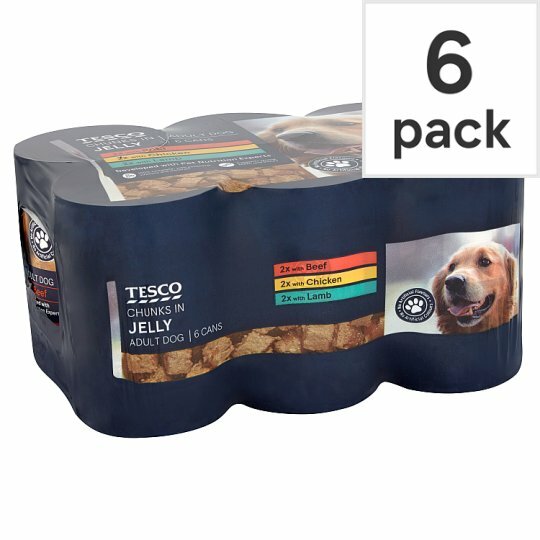 Tesco Chunks in Jelly Selection Tinned Dog Food 6x400g 1 7 Yrs 100 % complete and balanced nutrition Essential vitamins and minerals Calcium for strong teeth and bones No artificial flavours or colours Zinc for healthy skin and coat We've been creating deliciously tempting meals with our team of pet nutrition experts for over 30 years. Carefully prepared using wholesome nutritious ingredients from our trusted farms and suppliers, all our meals are complete, balanced and fortified with vitamins, minerals and nutrients, ensuring optimum health for your pet. We never add artificial flavours or colours. Store in a cool, dry place. Once opened, refrigerate and use within 2 days., Daily Feeding Guide, Body Weight Cans, 5 - 10kg 1 - 1.5, 10 – 20kg 1.5 - 2.5, 20 – 30kg 2.5 - 3.5, 30 – 40kg 3.5 - 4, 40 – 50kg 4 - 5, An individual dog’s requirement may differ from this guide; it will depend on the level of activity and the age of your dog. Best served at room temperature., Make sure fresh drinking water is always available for your pet, When introducing your dog to a new food, make the change gradually over 7-10 days, increasing the proportion of the new food each day. Additives: Technological Additives per Kg: Cassia Gum 1.6g Nutritional Additives per Kg: Vitamin A 1250 IU, Vitamin D3 250 IU, Zinc Sulphate Monohydrate 57mg, Manganese Sulphate Monohydrate 8mg, Calcium Iodate Anhydrous 0.82mg. Store in a cool, dry place. Once opened, refrigerate and use within 2 days. An individual dog’s requirement may differ from this guide; it will depend on the level of activity and the age of your dog. Best served at room temperature. When introducing your dog to a new food, make the change gradually over 7-10 days, increasing the proportion of the new food each day.